Hello girls, I have an antique rose mani for you today. Its not a mystery that stamping manis make me a quarter as excited or happy as freehand painted nails. But some like this one manages to appeal with its charm and elegance. Antique and classy work does sway my heart. There is a sense of stillness and serenity in them. 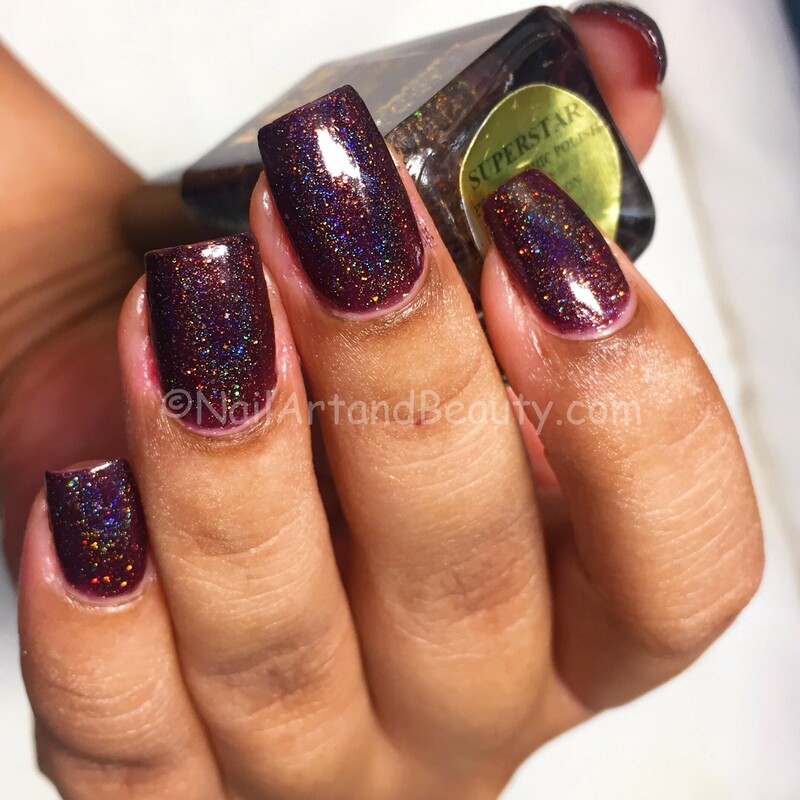 Fun Lacquer Superhero suited aptly to build on the mani, what can beat the richness brown gold holo? 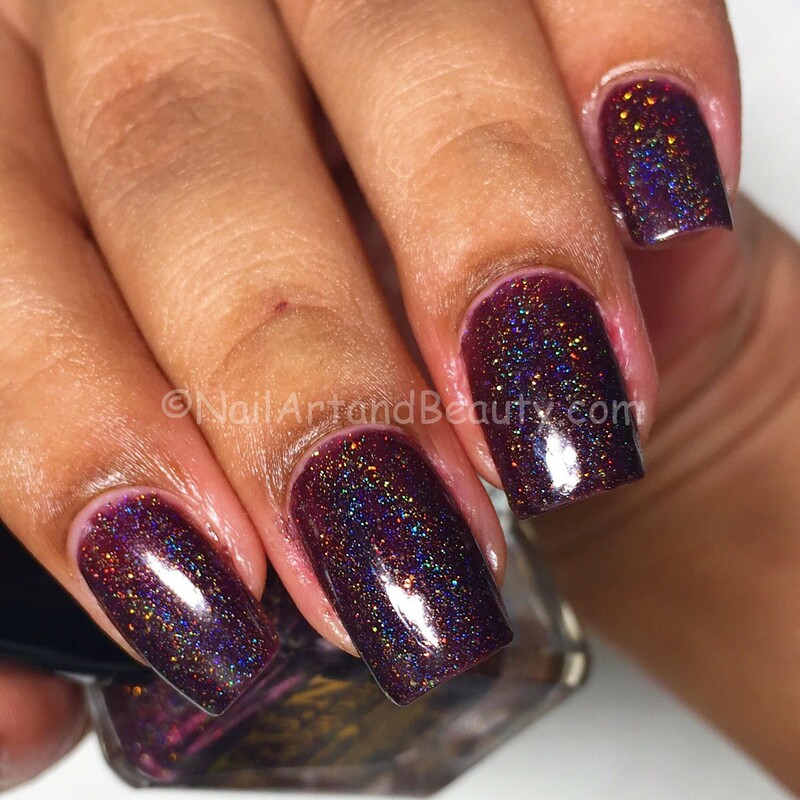 Sharing some swatches of Fun Lacquer Superhero. I wore them on their own and then did this nailart after 2 days. Good staying power, I must stay. 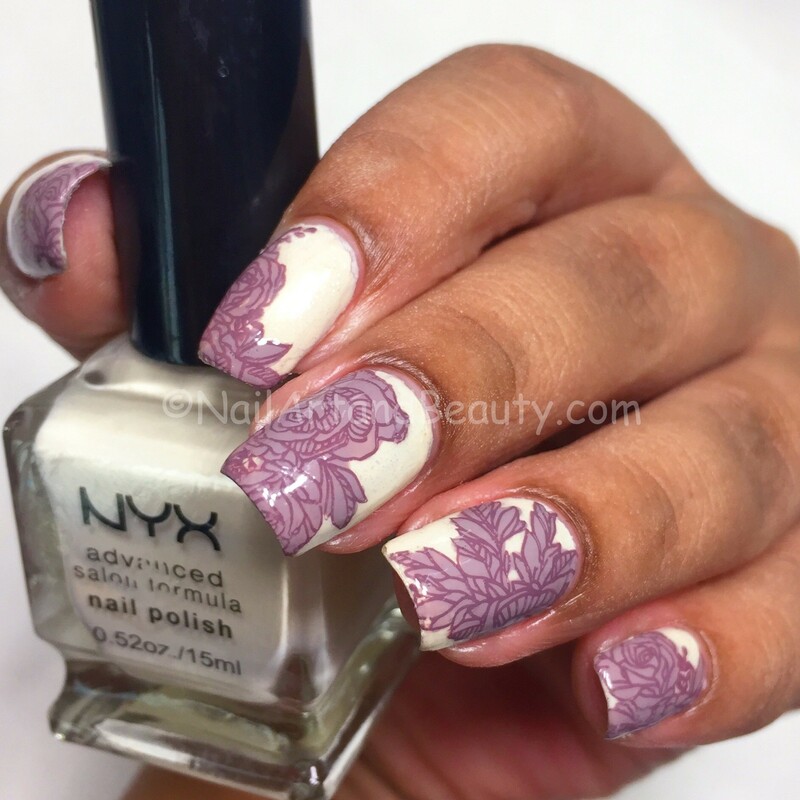 The prime inspiration for this mani was this Victorian looking antique rose image in AP 05- Stripe Revolution from their limited edition set that can be bought here. This one of my favourite BPS plates or any plate in general I guess. I intend to use each image from this, they are fabulous. 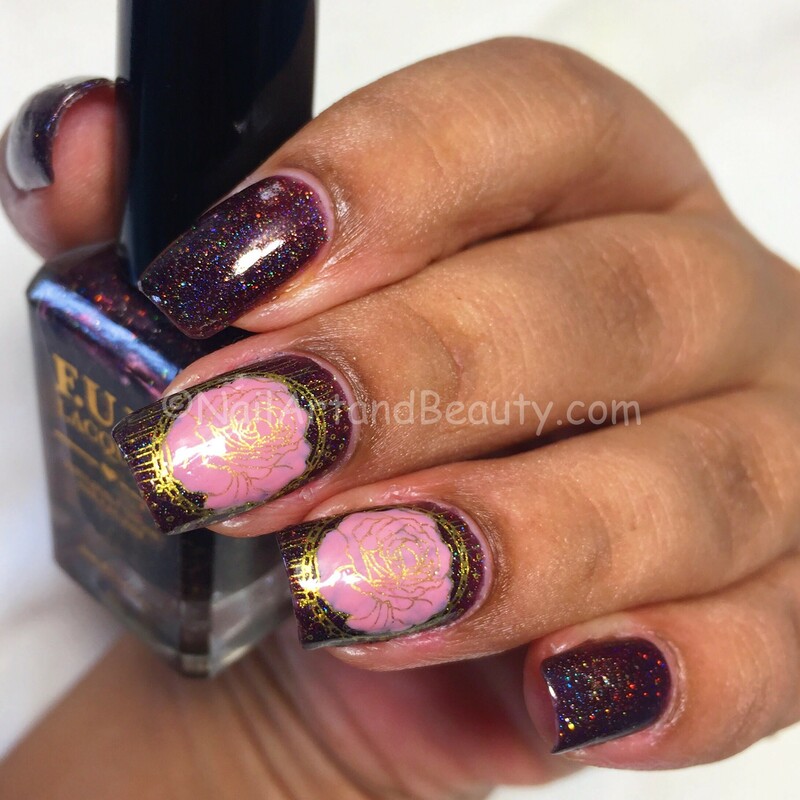 I did a stamping decal with El Corazon Kaleidoscope Gold and Sally Hansen Teeny Bikini. Then finished the mani with HK Girl Top Coat. I hope you liked the mani as much as I did. Let me know in the comments below. 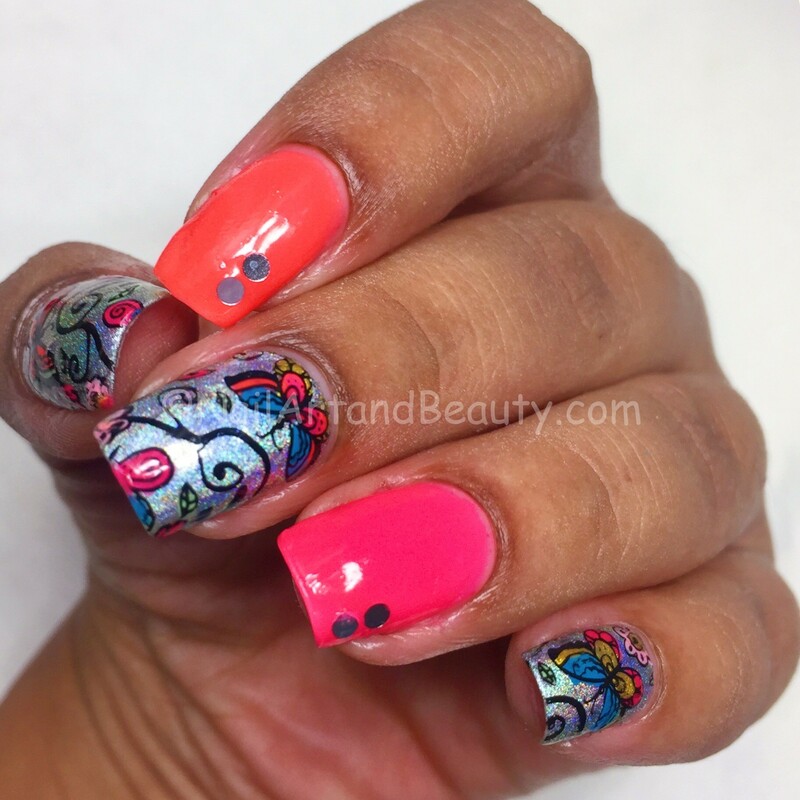 Hi Girls, I have relatively different mani to share today. On its own it may look rustically pretty. However, the spoiler is that it is poor man’s copy of an amazing mani done by Lou from Urban Nail Lacquer. I so adore her creativity and impeccable execution. 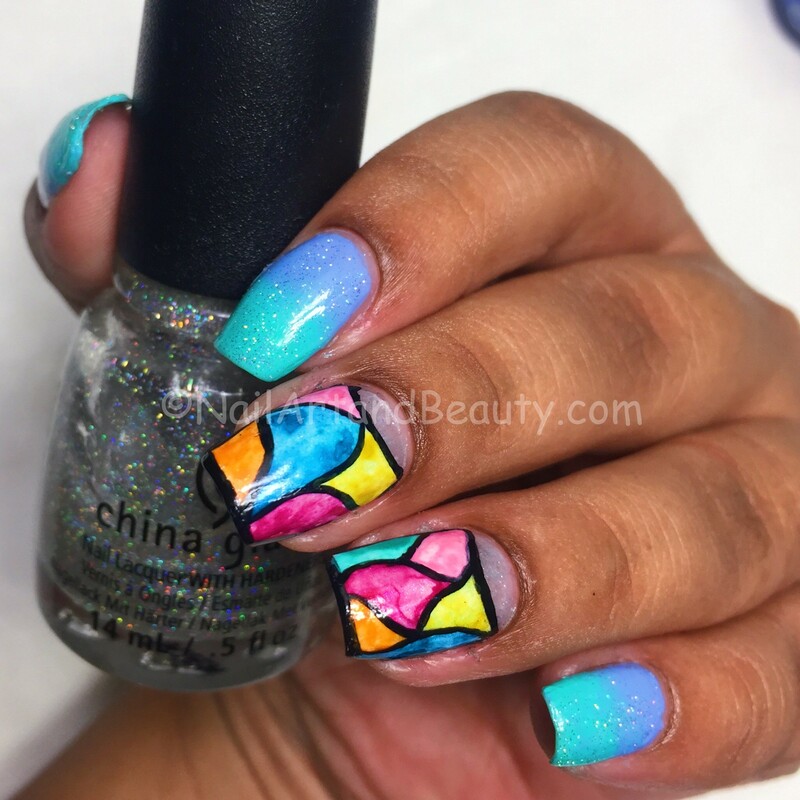 I had a hazy memory of this mani and I made it out of that faint memory. I was intrigued by the dusty gloomy taupe and grey and phunk of the bright coral stamped in gold. I hope you get the feel too. The taupe polish is from Nails brand which I picked from Malaysia, Nkyaa Watermelon Sorbet and El Corazon Kaleidoscopic Gold. I used MDU Dark Grey to sponge the tips and edges of the nail. 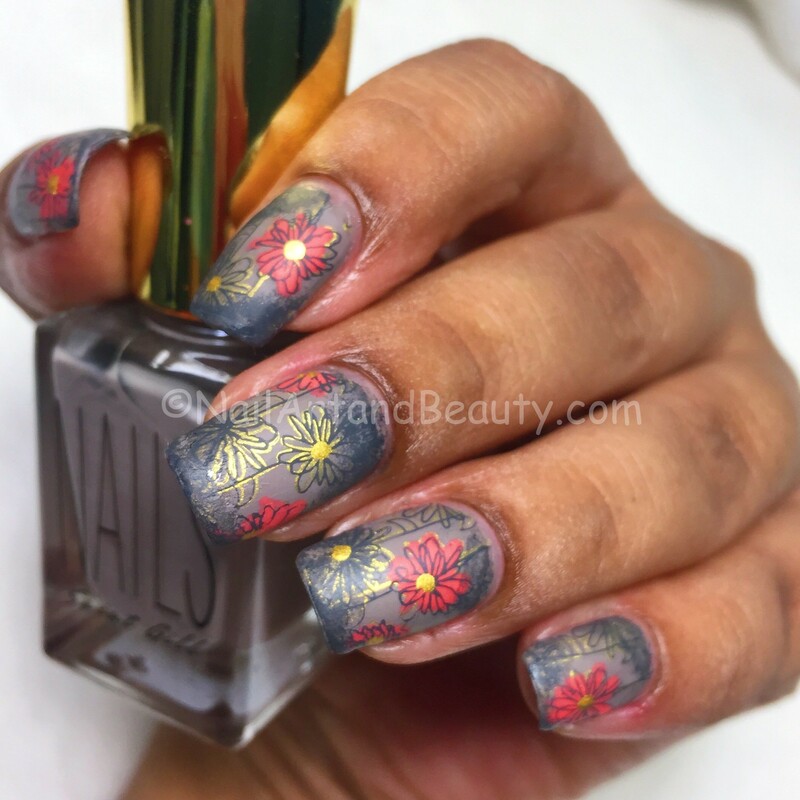 The stamping plate BP A01 Flower Tango is from their LE Set which can be bought here. 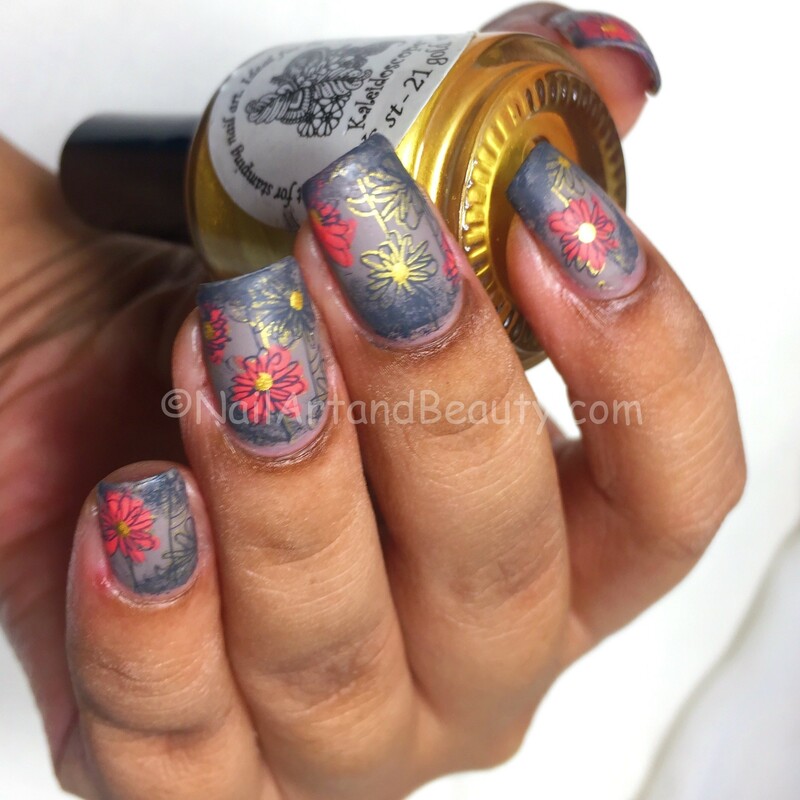 Hello girls, I am excited to share a freehand floral mani which is inspired by wallpaper print my friend shared a while ago. 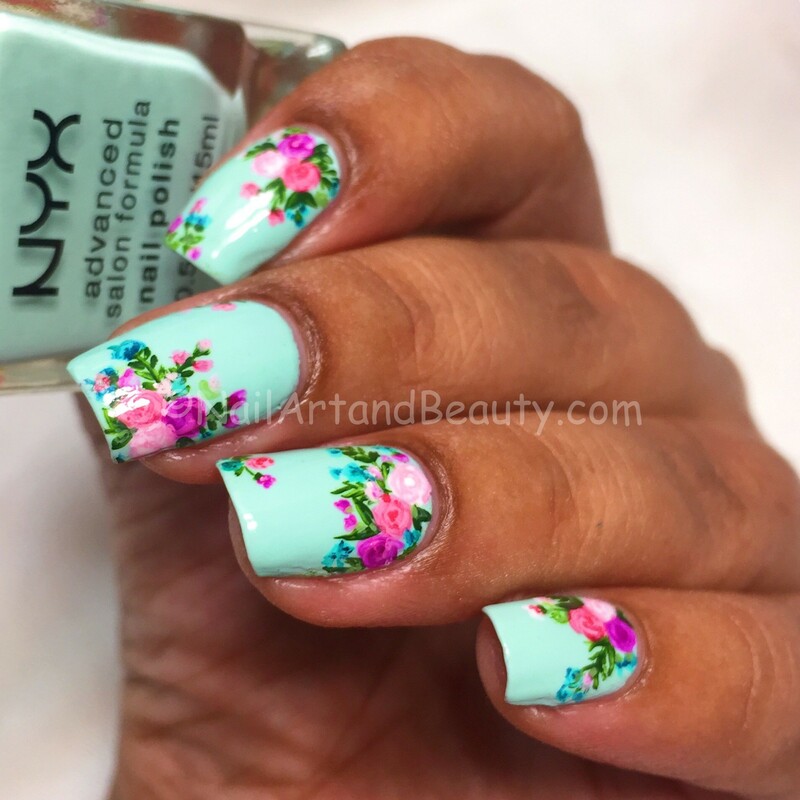 I so loved the soft subtle and vintag-y roses on mint that I decided to do a nailart inspired by it. It always gives me supreme pleasure to be able to paint something I love on my nails. And I am fairly pleased with the mani. The base is NYX Pastel Mint which is a soft soothing color. 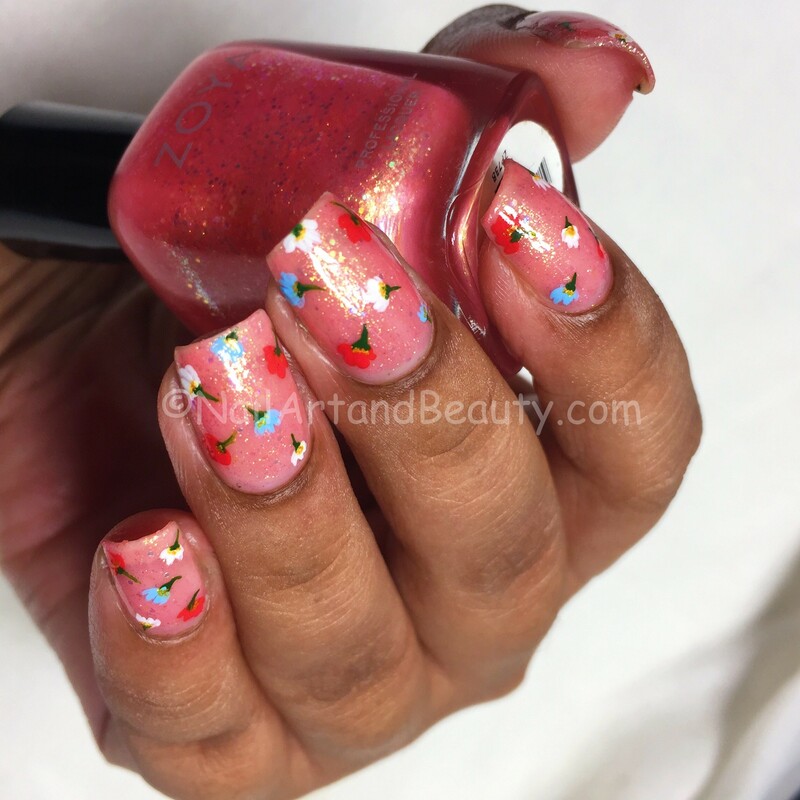 I took my new Bornpretty store brushes from the review kit for this mani and I am mighty impressed with them. I love their brushes and I keep on saying this like a broken record. You can buy them here. This mani was immensely satisfying and it turned out pretty I think. What say girls? Leave your thoughts in comments below. 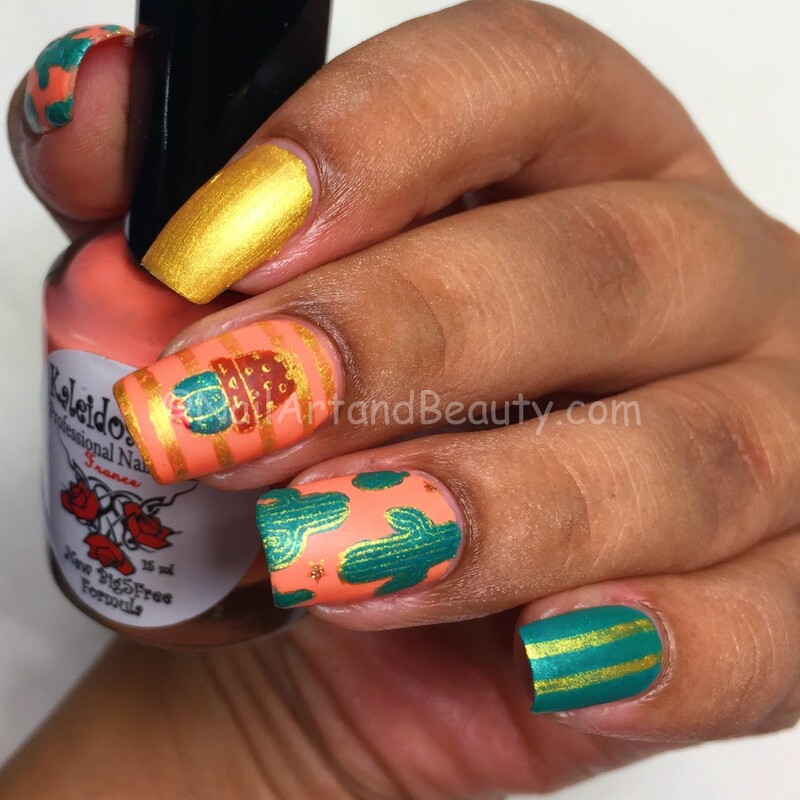 Hi Girls, after a long spell of flowers on my blog, I have a desert cactus mani to share with you today. Me being me, I decided to brighten my desert cactus instead of a parched dull one. I used Bornpretty Store BPA-04 Passionate Desert from their limited edition set which can be bought here. I must tell you, its a pleasing bouquet of assorted plates. 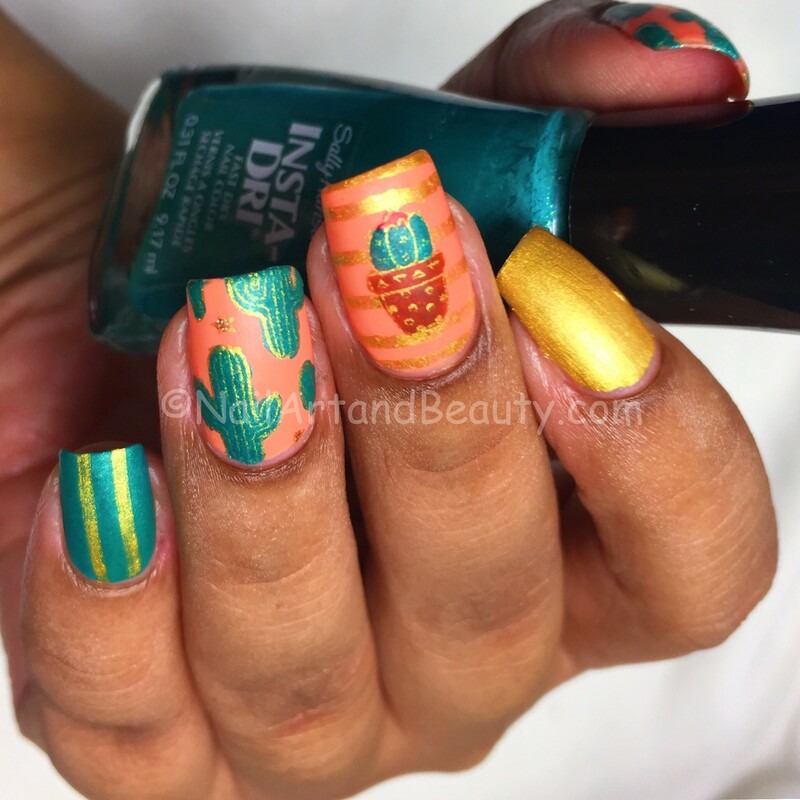 I wanted to make these cactus looked bright and loved. 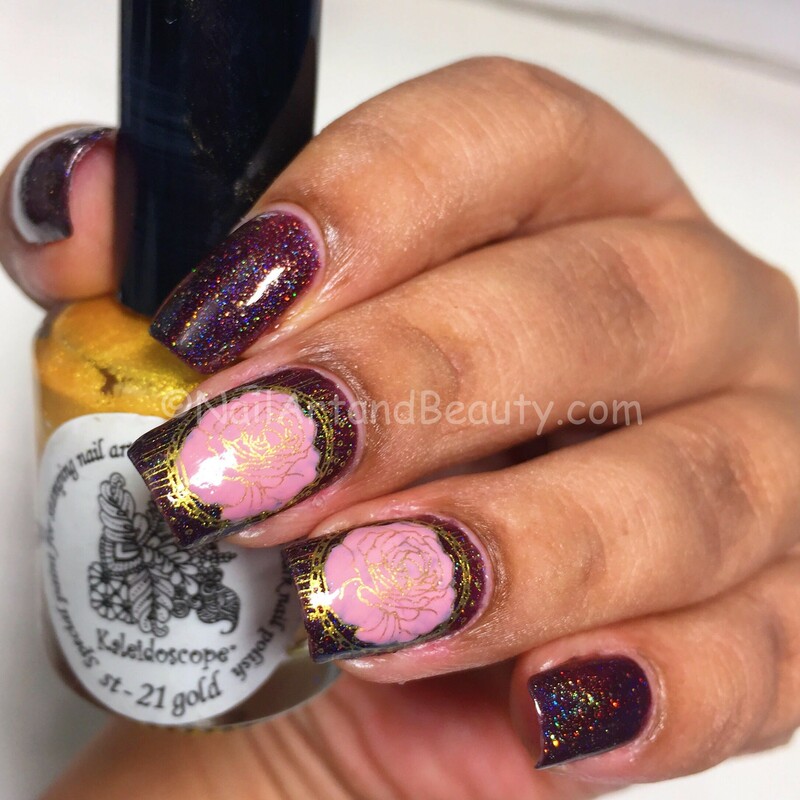 So I chose some bright contrasts and gold for advanced stamping. The polishes used are El Corazon Gold, Sally Hansen Insta Dry Steal A Base and Orly Freeflow. 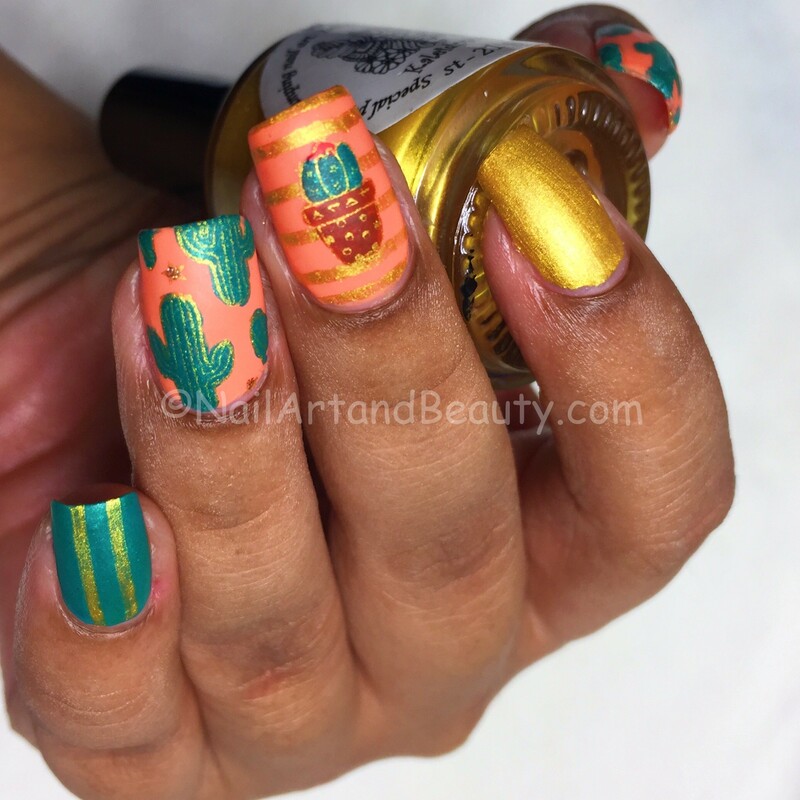 I hope you like this take on desert cactus mani. 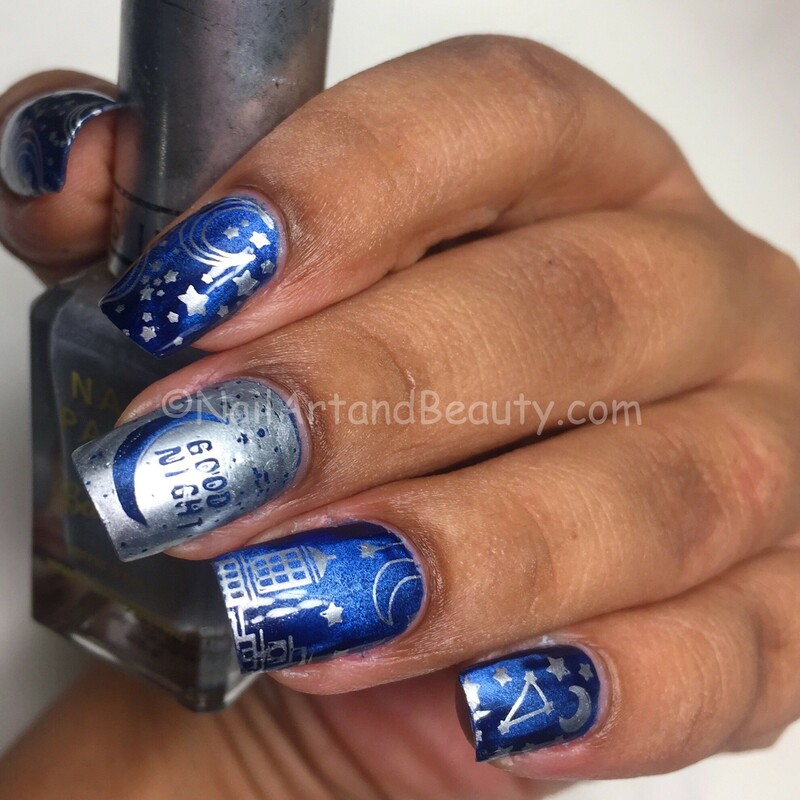 Hi Girls, I have a nighty night nails to share with you today. This was again an unplanned mani, I intended to do something else on my polish. And I blame Masura Cobalt Damasse for this change of plan. Whenever I apply this polish it takes my imagination to dark mysterious nights with moonlight and lit skylines. And this day was no different. 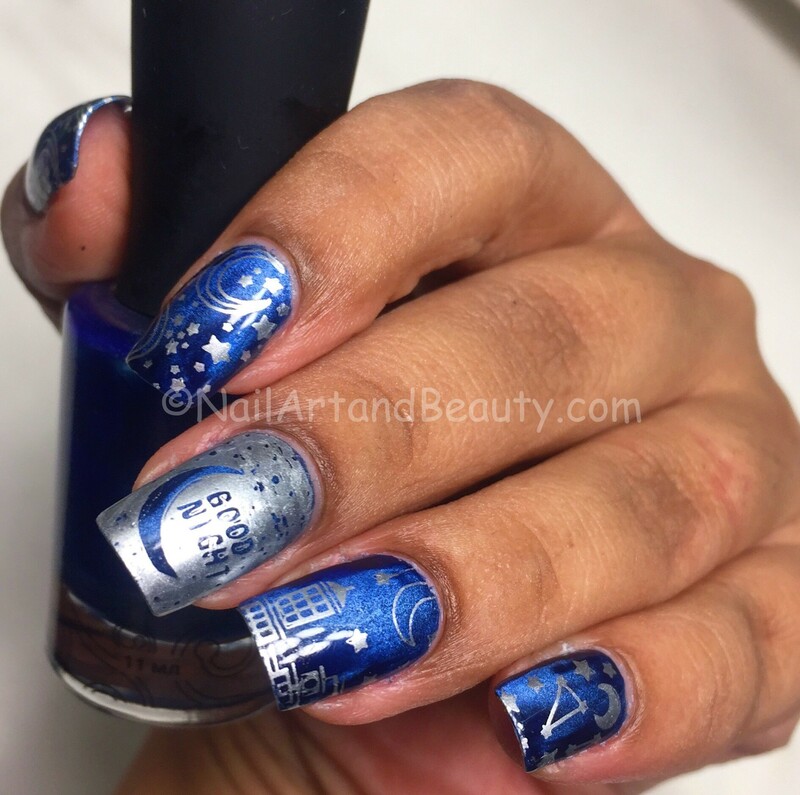 Fortunately to aid to my imagination I had this stamping plate for my perfect night mani. The 'Good Night' text on of the images appealed to me. 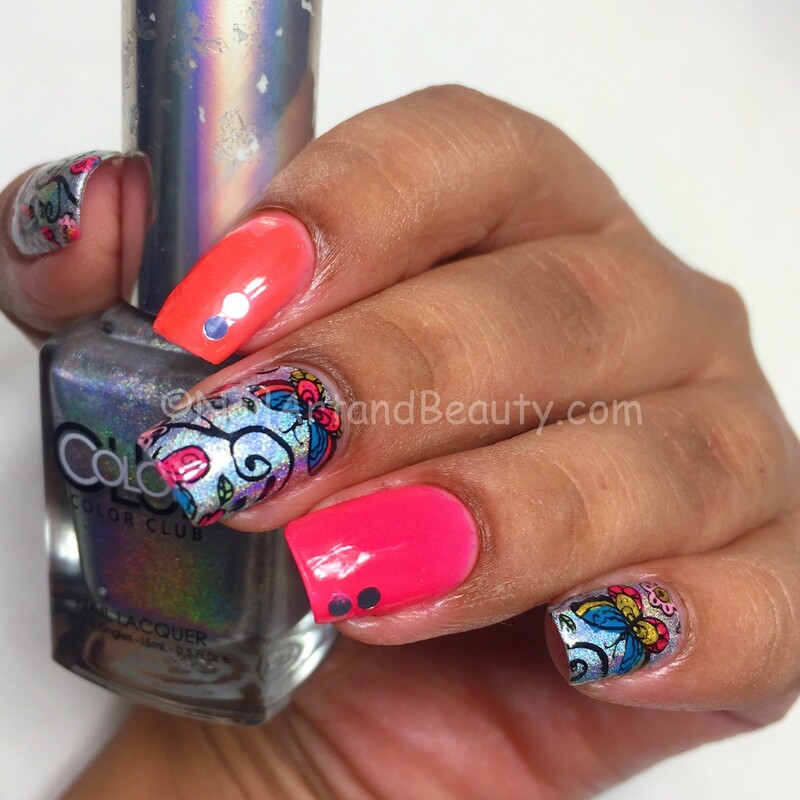 The stamping plate is BPA09 Deep Cosmos from Born Pretty Store LE Stamping plate Set. You can buy it here , it is an exciting collection. 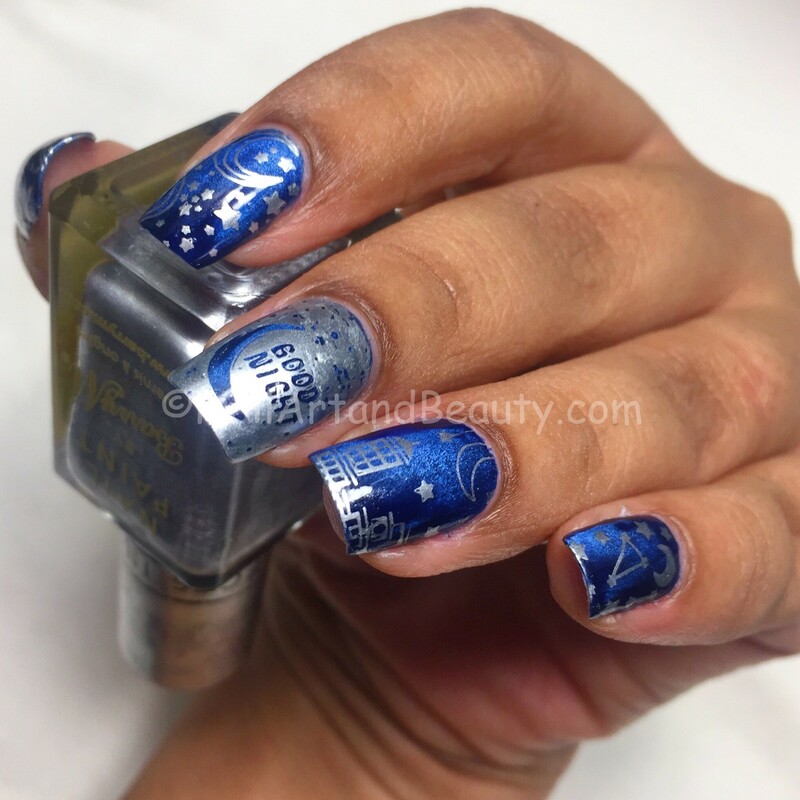 I used Barry M Silver Foil for Silver Stamping and then sealed the mani with HK Girl Top Coat. 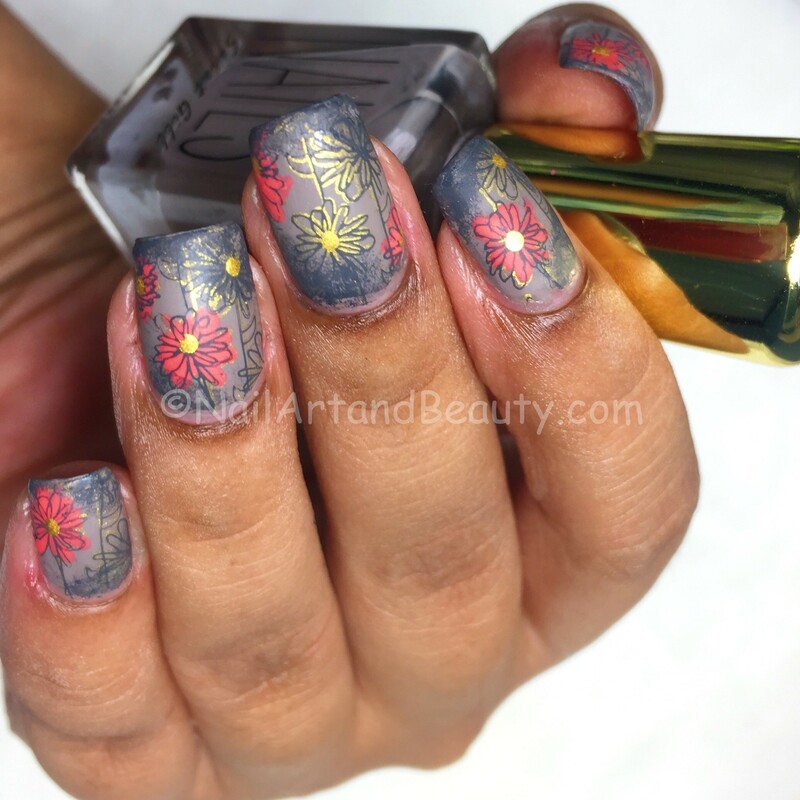 I got this classy taupe stamping polish for consideration from Bornpretty store. I own quite a few stamping polishes from this line and each one stamps like a charm (yes, even on dark bases). You can buy them here. The base polish is NYX First Dance, it’s a soothing off-white crème polish. I enjoy these for a soft non-interfering base. I have had this polish for 4 years and it still features in my top nudes and off-whites. 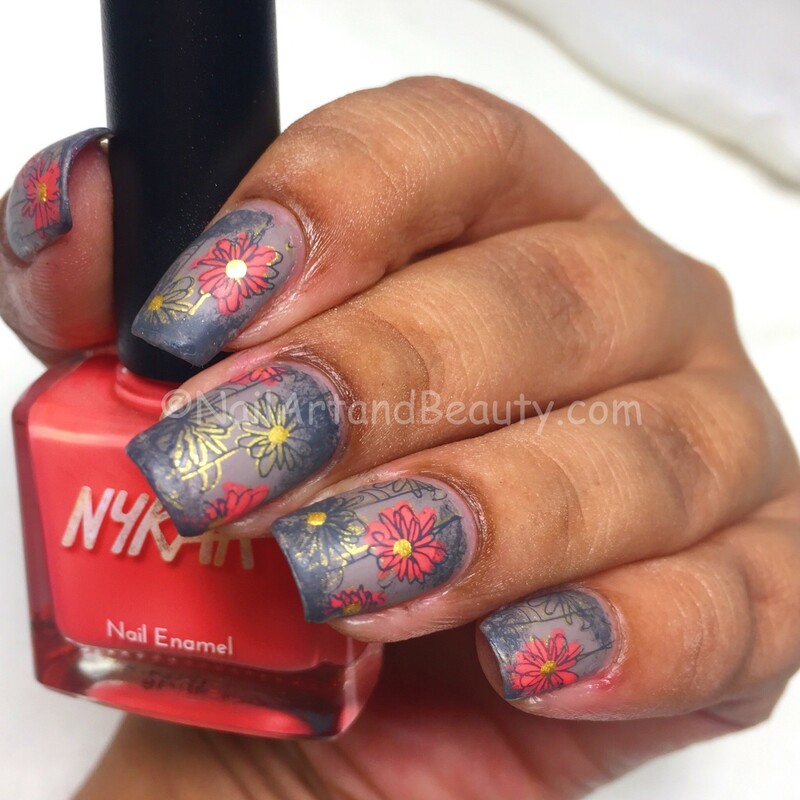 I did advanced stamping with BornPretty Store BPL 067, BPS Taupe stamping polish and Zoya Eastyn from their Transition Whisper Collection. It turned out very classy and work appropriate. What do you think? I hope you like the soft and taupe touch to the roses. You know how it feels so exhilarating sharing an art work whose process of creation is as joyful as the finished product. 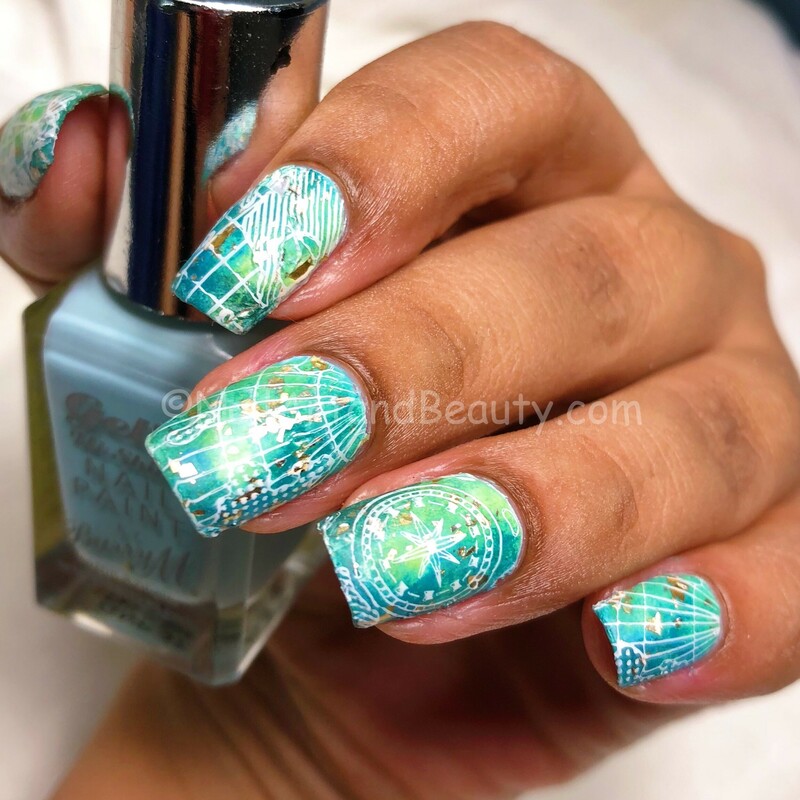 It gives an unparalleled high doing something you love in a way that you love; which is freehand nailart in my case. 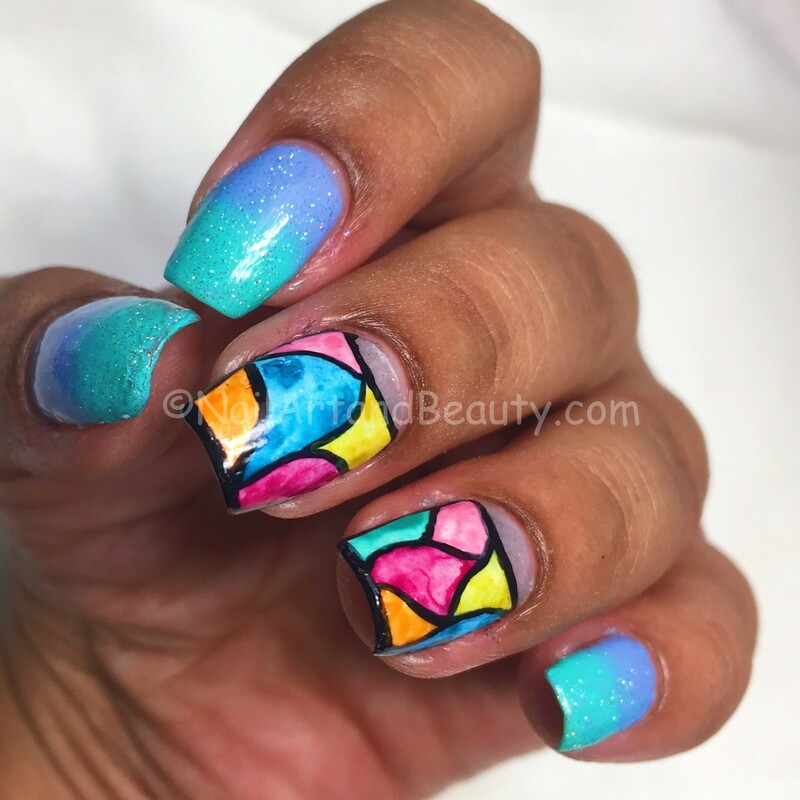 I thoroughly enjoyed planning the randomness of this abstract painted mani. I have been mightily inspired by TartOfFraises account on IG. But I always struggle to believe that I could do even half as good, so I just screenshot her manis for the sole purpose of admiration. This is the first time, I overcame the hesitation and attempted a remote recreation of her work. Oddly enough, I did not screenshot the original mani. I recreated this out of memory so I don’t know how distant or near it is to the original. You are better judge. One of the biggest motivator for this trial was my new brushes from BornPretty brush. Oh, how I love their nailart brushes. You name it and they have it. This one can be bought here. If you are into freehand nail art I would strongly recommend browsing BPS for brushes. The polishes used are Cornflower Gleam and Turquoise from Models Own topped with China Glaze Fairy Dust, OPI Bubble Bath topped with Essence Pixie Dust and HK Girl Top coat finally. The artwork is abstract and freehand filled in with water color method. I hope you like it, I for one adored these. 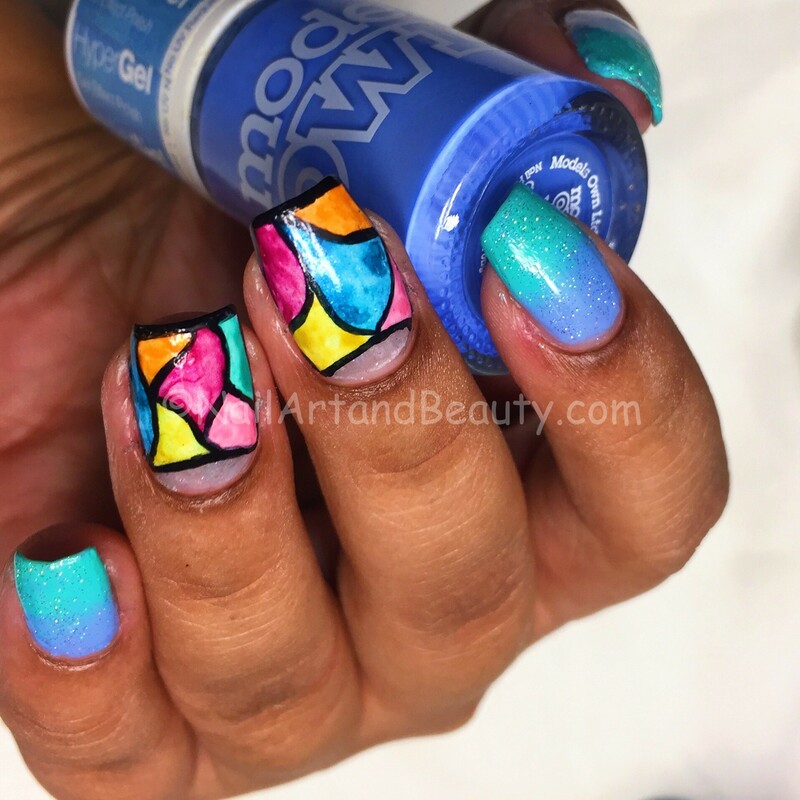 Do you ever feel at times that even immense planning falls short of acceptable results while some random playful execution blows your mind.I have one such spontaneous mani to share with you today. I am an old school girl in terms of planning and organizing, it feels reassuring and in control when things go in a near predictable way. Like everything in my life, I take time to plan my mani in advance; even the minute details as to what polish, technique, brush, stamping plate etc will be used. I even schedule my blog posts so much so as a month or two in advance. 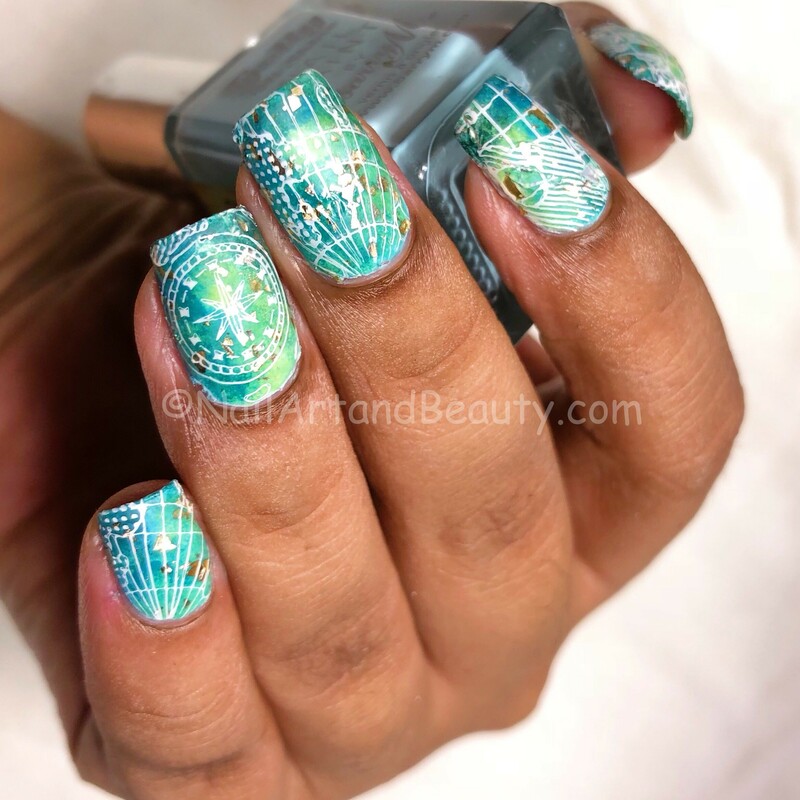 Now, I had seen this unique image on my BPS stamping plate and since then my mind was wandering on how to best use them.I had so many ideas but when I sat down to do the mani, I somehow came up with something totally different. I do enjoy and relish this form of creativity too; paint your heart takes you. 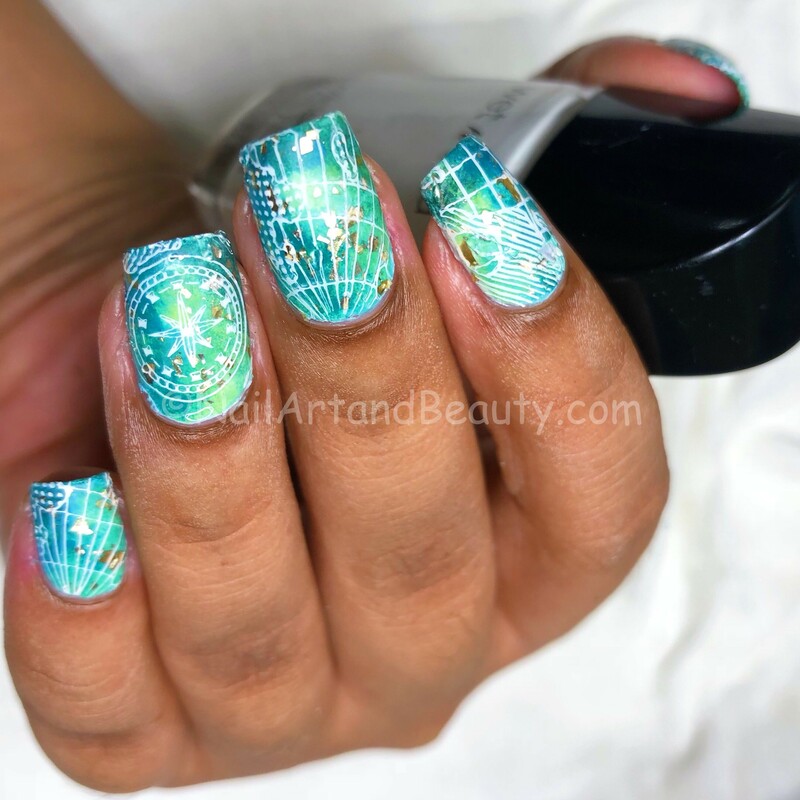 I must say the gradients may seem complicated but it was super easy with BPS Dual Ended Gradient stamper. It indeed is a star product. You can buy them here. The stamping plate is Poetry Journey from BPS LE Poetry Set which can be bought here. 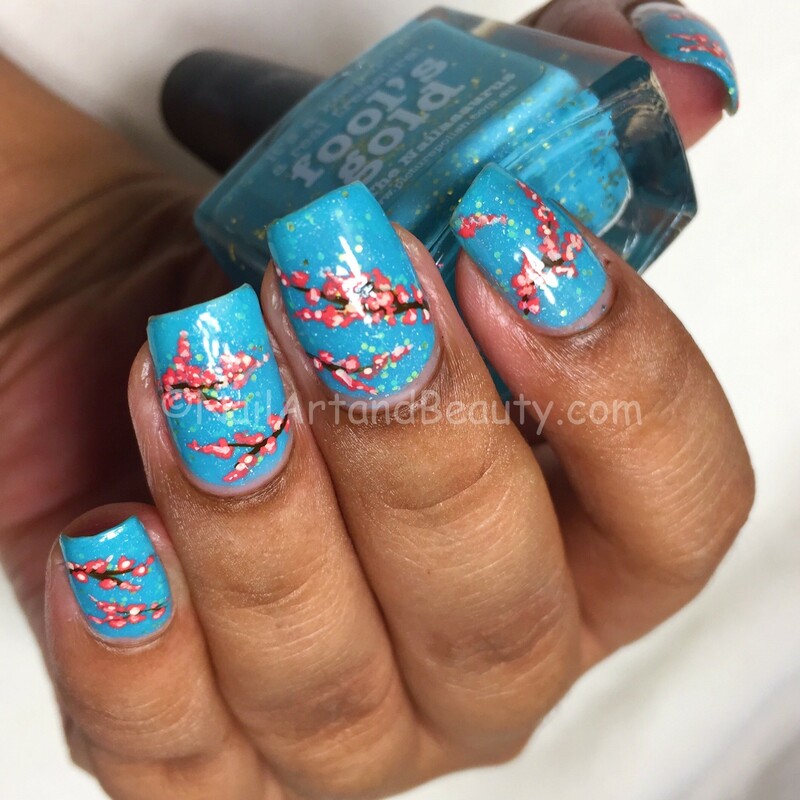 Hi girls, my last mani was about rains and what comes after rains is a rainbow. I thought instead of going with a traditional rainbow, I would do some rainbow coloured butterflies. Ever noticed how butterflies are even more vividly colourful than the rainbow? 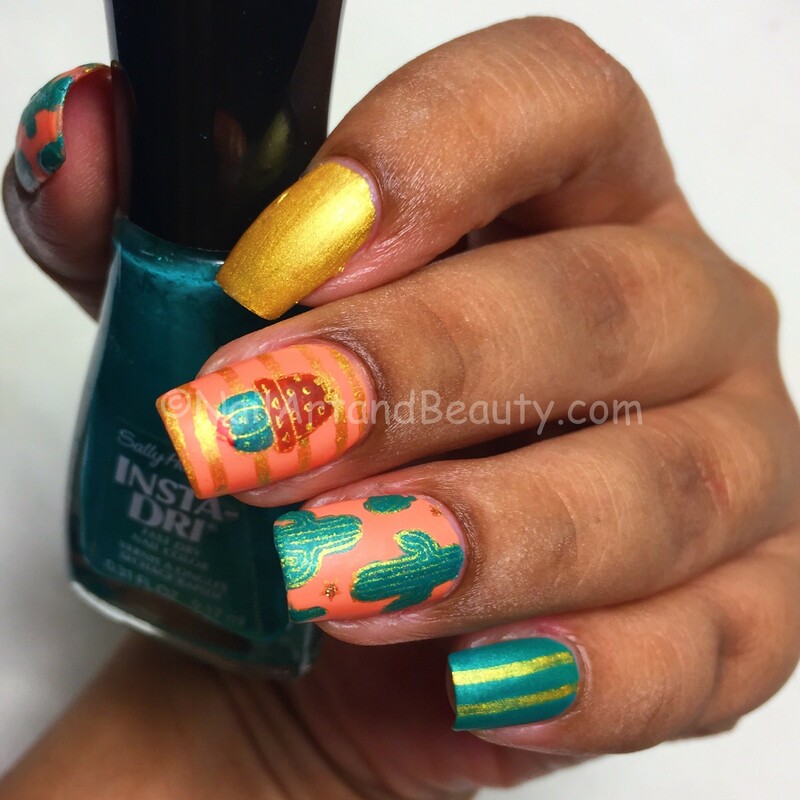 I was itching to use my new stamping plates from my Bornpretty store review pack. They sent me 2 complete sets of stamping plates along with other items. 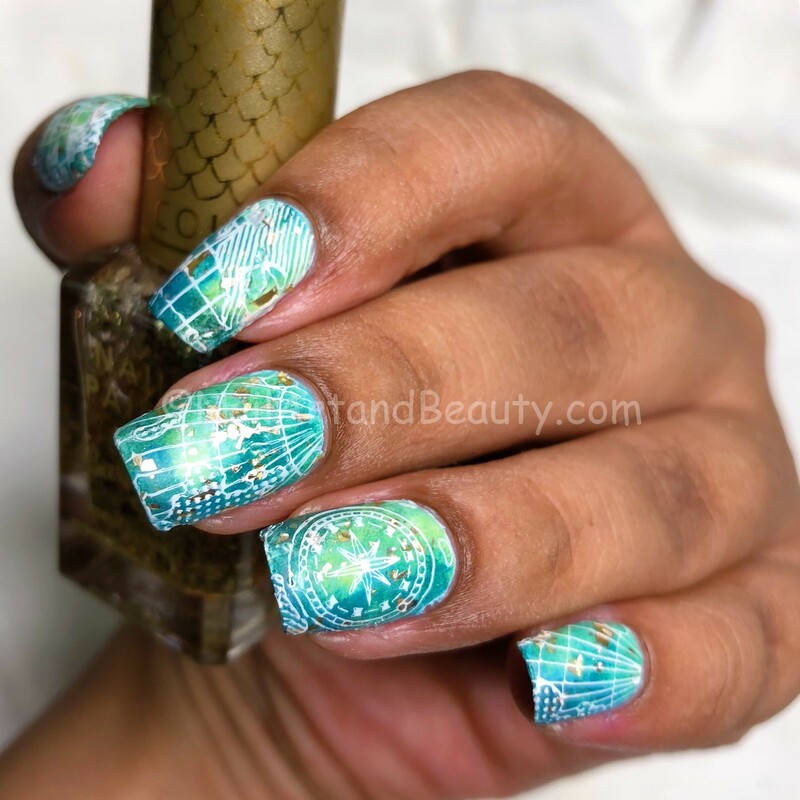 For this nail art I used Mandala Butterfly from Stamping Template Rectangle Flower Strip Mandala Nail Art Image Plate set. Each set consist of 5 limited edition stamping plates. You can buy the set here. I used Color Club Harp On as the holographic base and -Sun kissed Miss and Rays the Bar from their Heat Index Collection. I did some advanced stamping to fill in the butterflies. The nailart looked something different in person. It was so holo-y and neon-y. But neons are so camera shy, they turned out to be completely different in the pic inspite of numerous trials. Please share some tips people if you know better ways to capture neons. 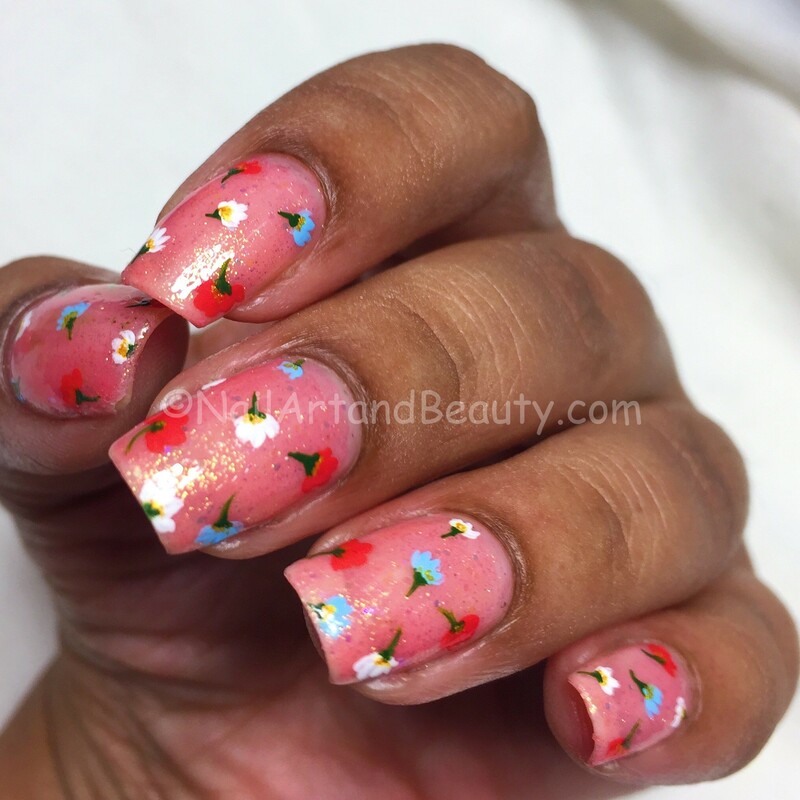 Hi friends, I have some teeny-meeny florals on my nails today to share with you. The original idea of drawing these countryside small flowers is from Robin Moses. I had seen them on her account and got inspired. I should have taken a screenshot rather than depending on my memory because I got the colours wrong. Her’s looked little more elegant. Anyways that’s Robin and this is no so there is no parallel. The base is Zoya Madison topped Zoya Harper. 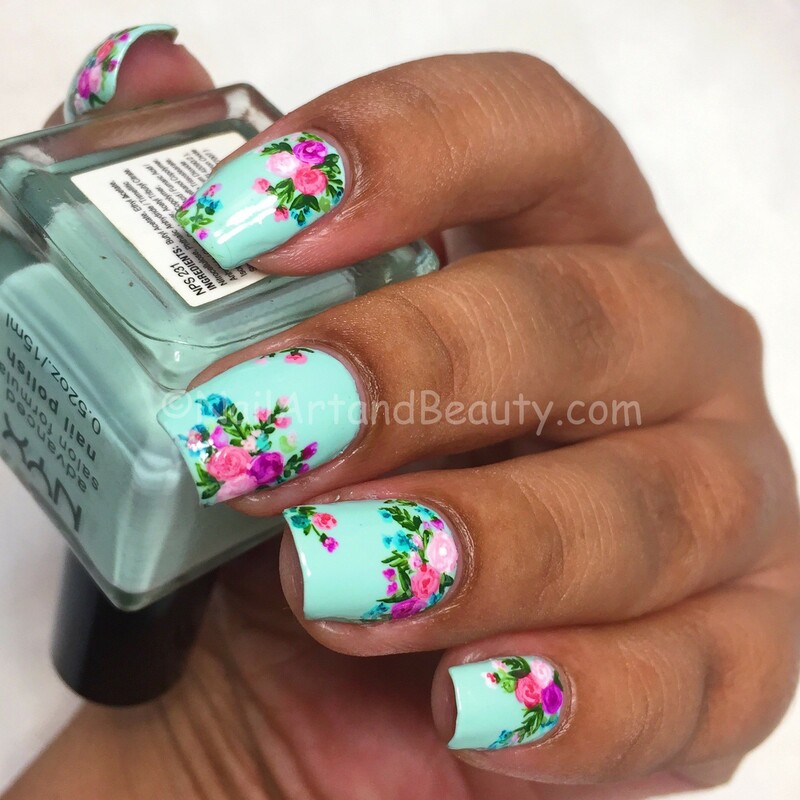 I painted these flowers freehand with acrylic paints and nail art brushes from Bornpretty store. I do not know how many times I have said like a broken record that I am always impressed by BPS nailart brushes. If you are into freehand you must have them. It has been 6 years of me doing nails and I have always got my brushes from them. You can get these here. I realise the color of flower does not match the original mani either. I may have distorted Robin Moses countryside flowers. Note to Self: Do not depend on memory, take screenshots. lol. 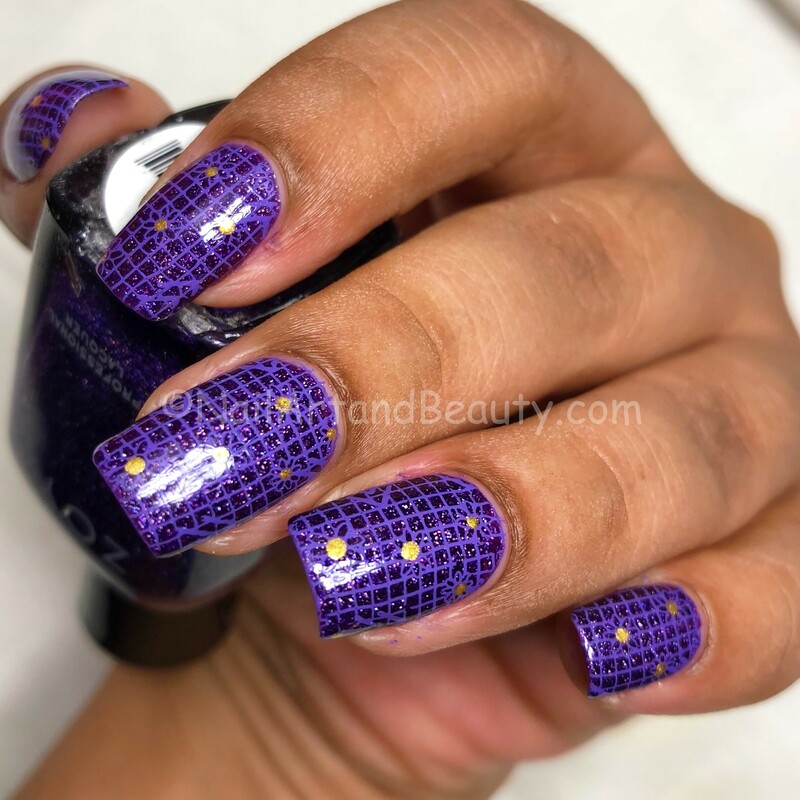 Hello Girls, I have a purple monochrome mani to share with you today. And the choice of scattered purple holographic makes it look so royal and rich. 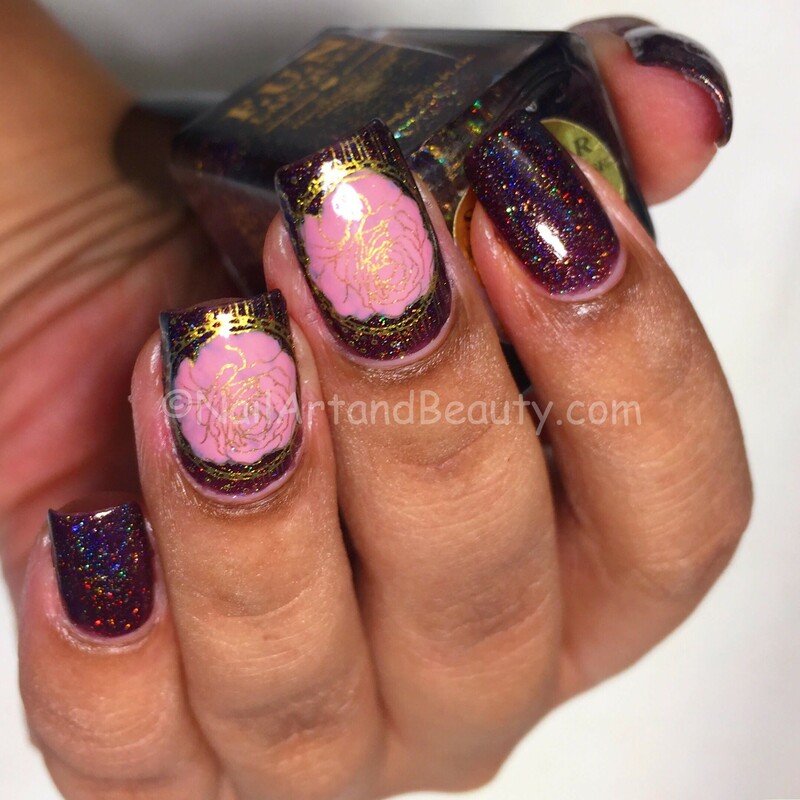 I did this mani for Indian Lacquer Lover Challenge with theme 'monochrome' which I originally intended to pass. But seeing how the mani turned out, I am glad I attempted. 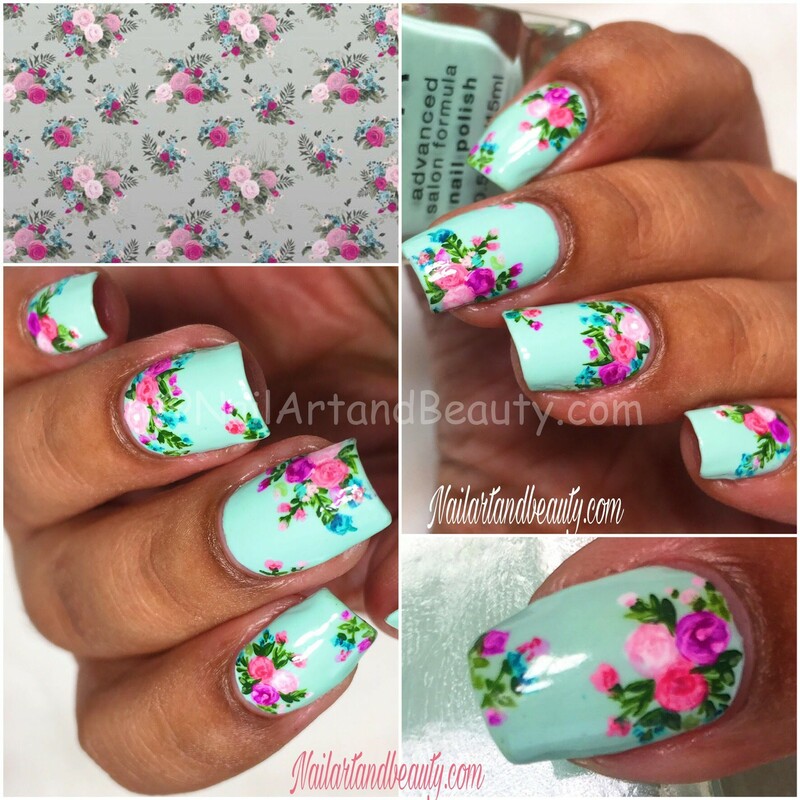 The mesh like image with flowers are from Bornprettystore stamping plate AP-05 Stripe Revolution. They belong to the the limited edition set available here. I am pretty impressed with this set in particular and AP05 is my favorite out of the set. 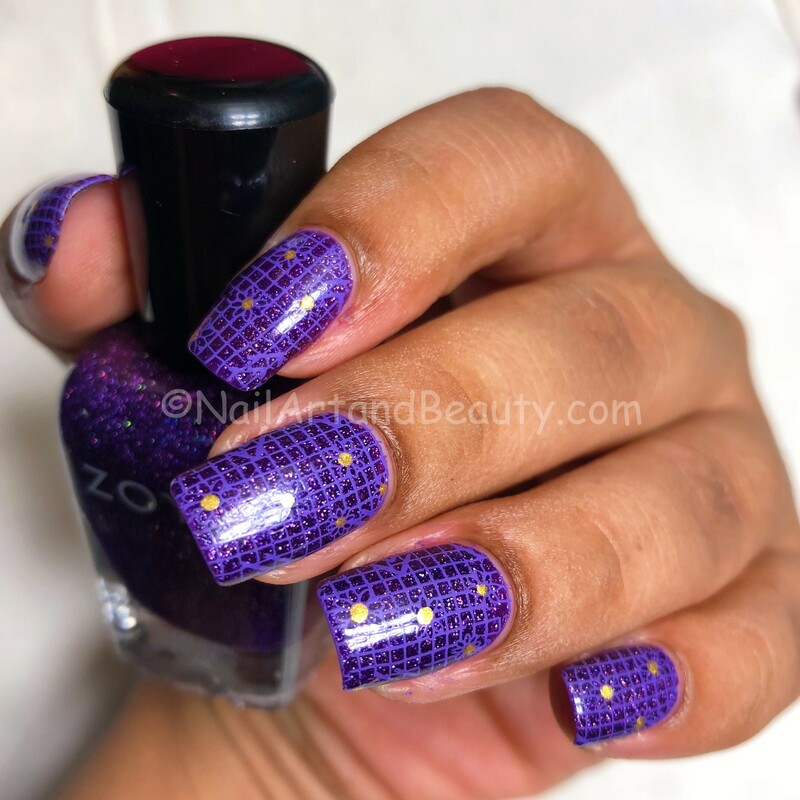 The base holography purple is Troy from Zoya Urban Grunge Collection and the stamping polish is from MDU. I just used a little gold to accentuate the centre of the flowers. Hope you like the mani. 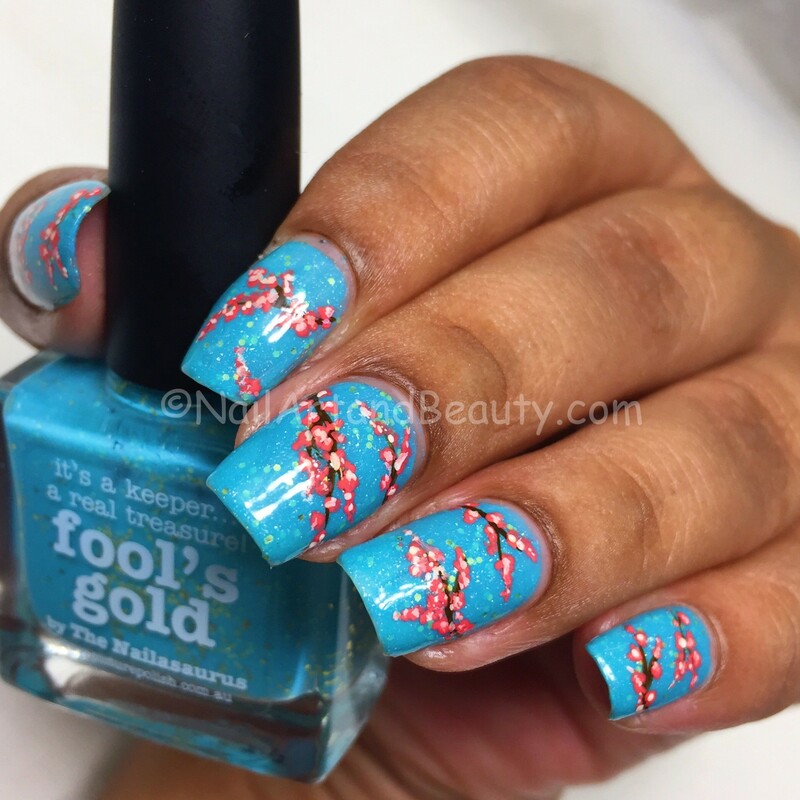 Hi girls, I have some cherry blossom nails to share with you today. 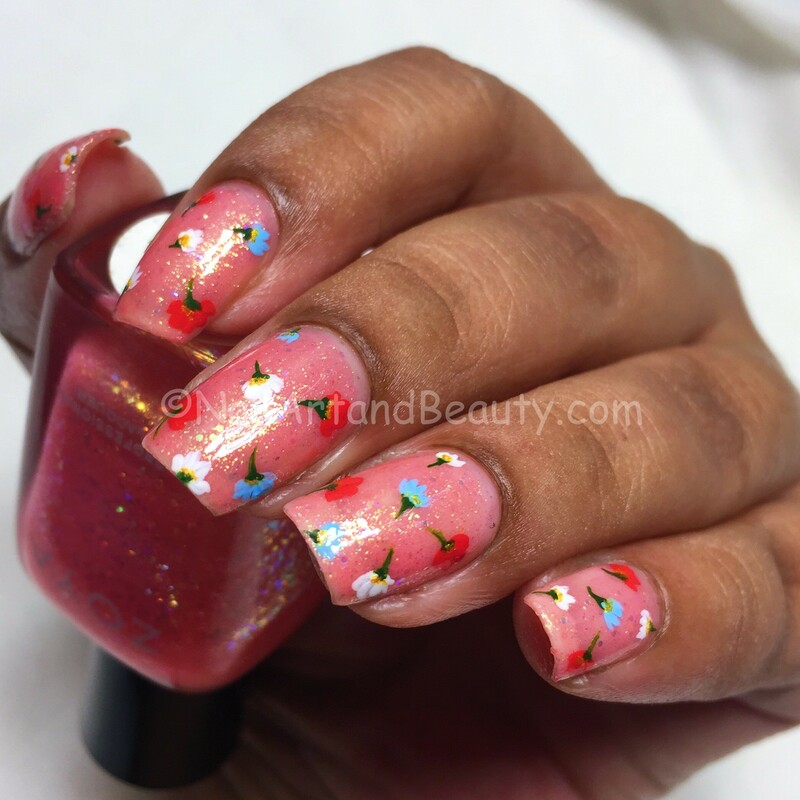 Now, these are not the first cherry blossom nails on my blog. But I am unapologetically biased towards the bounties of nature. The excuse for this time is one of my friends travelling to Japan kept sending pictures of cherry blossoms and all pretty things there. Oh my heart melt each time I laid my eyes on the beauty. On this evening,I felt my heart slipping through my brushes to my nails and I painted these. Simple yet very satisfying to be privileged to see some fresh blossoms on my nails whenever I want to. The base polish is Picture Polish Fool’s Gold. The cherry blossom is painted using acrylic paints and my favourite Bornpretty store and you can buy them here. To finish the mani I did a generous coat of HK Girl Top Coat. 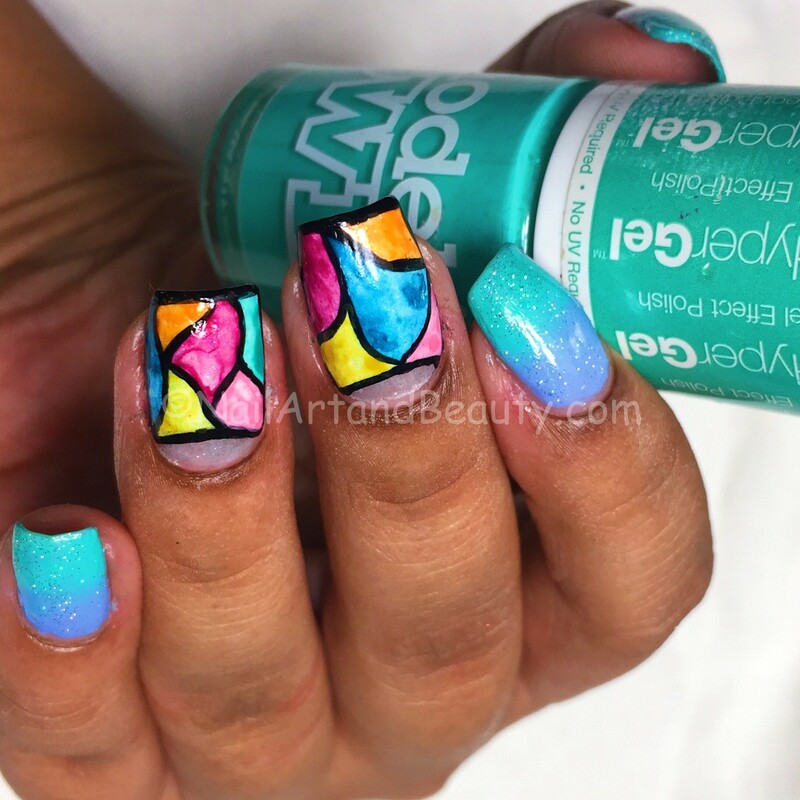 What do you think of my mani girls? Can you ever get bored of Cherry Blossoms? Hi Girls, how have you been? 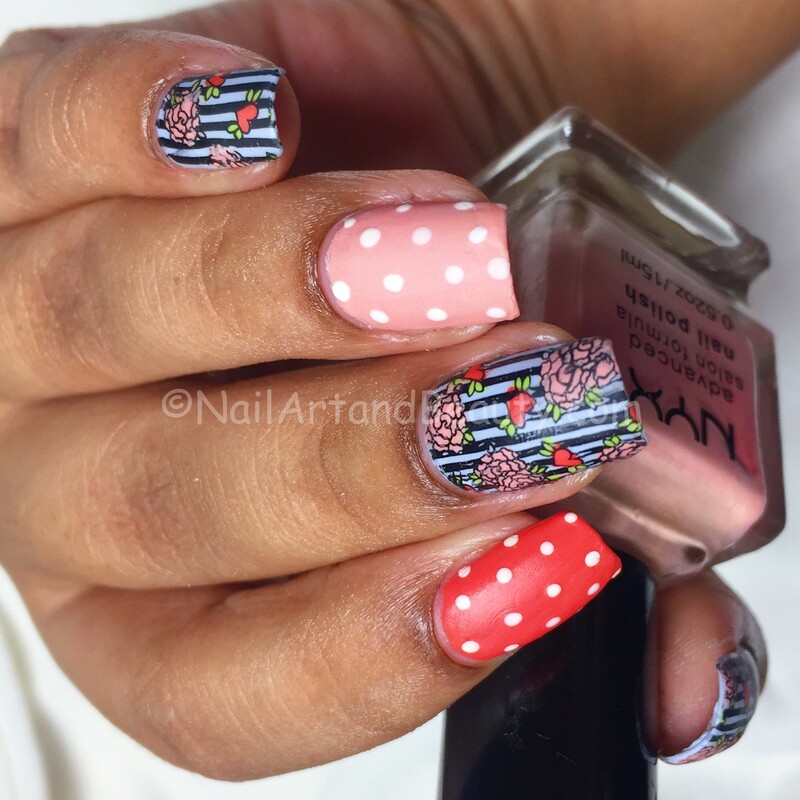 Today, I have a classic roses mani with delightful combination of stripes and dots. 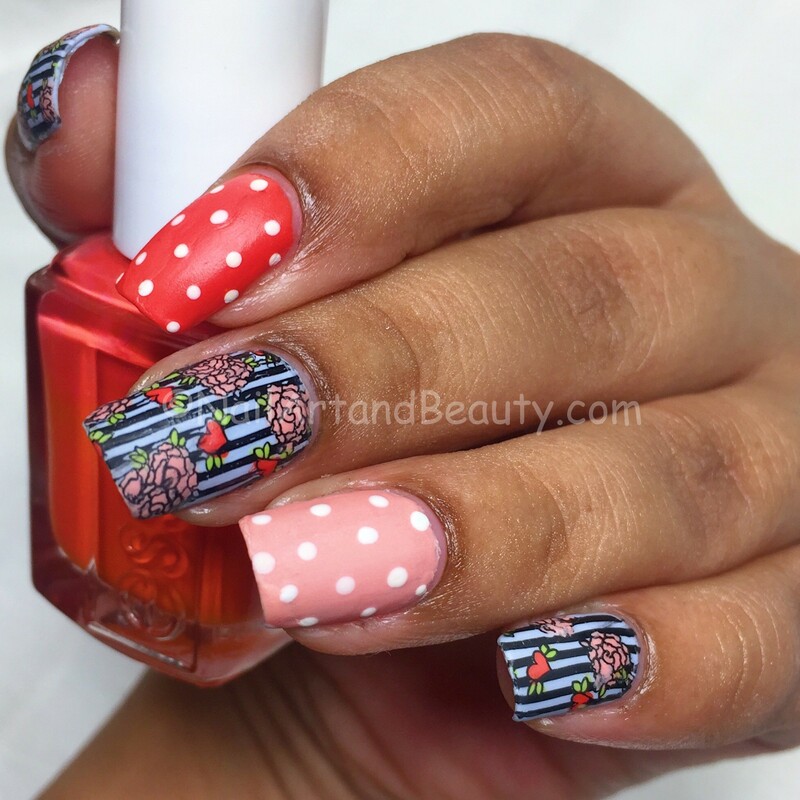 I was head over heels when saw this image of roses meshed in stripes in Bornpretty stamping plate AP05 Stripe Revolution. I must say I am impressed with the selection of images and themes in the recently launched Limited Edition stamping plate sets by BPS. You can buy them here. 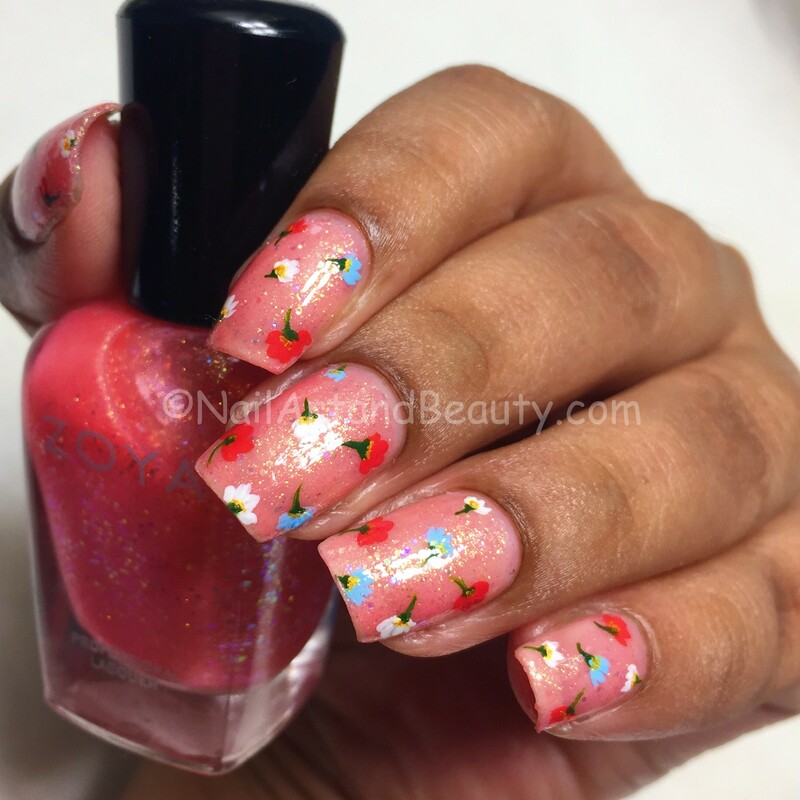 I used Sunshine State of Mind and Petal Pusher from Essie, Pastel Pink from NYX and Inglot Matte Top Coat. I think a classic look still has its charm which never fades. 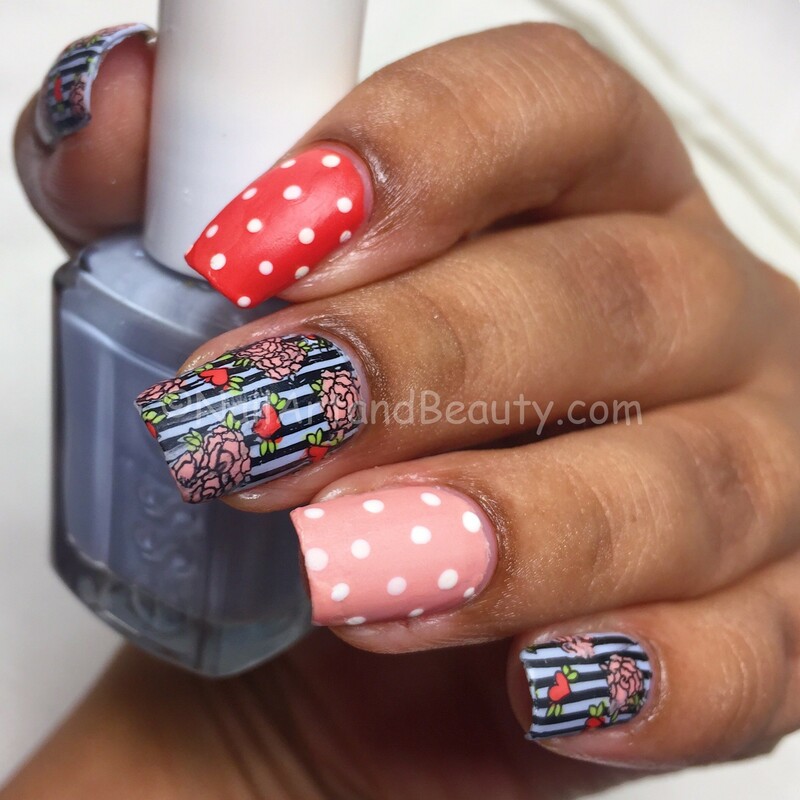 The roses in conjunction with the almighty stripes and cute polkas can never fail to impress anyone. I felt a matte look gives a perfect finish to this picture. 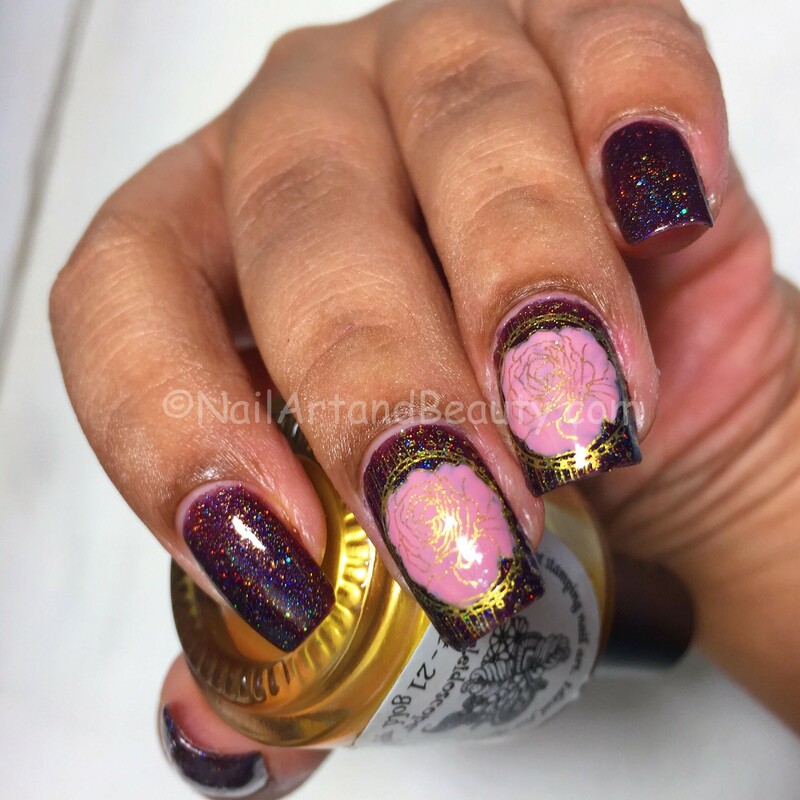 I carried this mani for around 4 days which is pretty long in the mani world. But that’s how much I loved it. I hope you do the same. 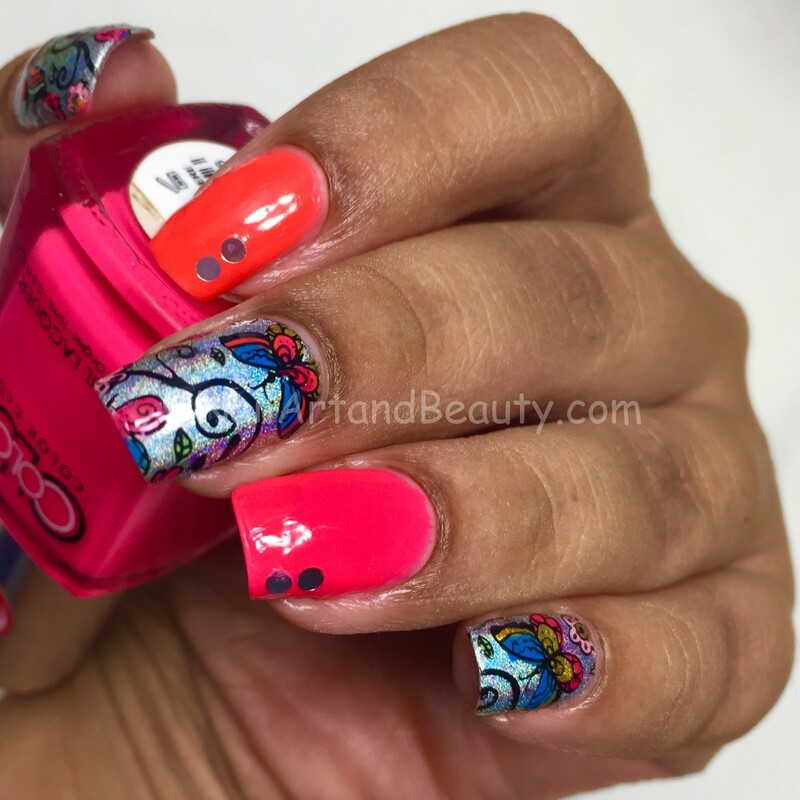 moyou stamping plate Pro collection.